The scene always leaves Scott Williams with a feeling of awe and hope. For three days, more than 20,000 youths from across the United States come together to share their faith at the National Catholic Youth Conference (NCYC)—taking over Lucas Oil Stadium and the Indiana Convention Center in Indianapolis with a joy and a spirit that offers so much promise for the future and the present of the Church. “Besides the closing liturgy—which nothing can compare to having 20,000 people celebrating Mass together—my favorite part of NCYC is when the gates open to Lucas Oil Stadium for any general session,” says Williams, the director of youth ministry for the Archdiocese of Indianapolis. 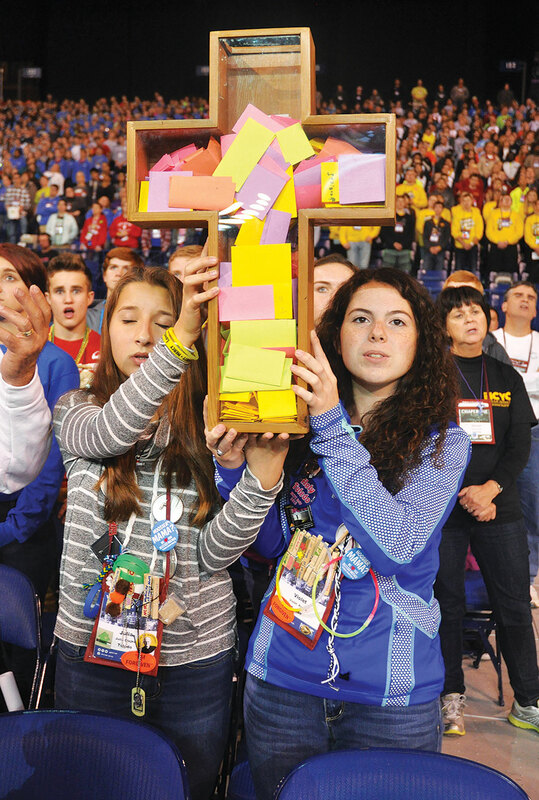 That energy and excitement will be on display again as the archdiocese hosts its fourth straight NCYC on Nov. 16-18. In anticipation of the event—which relies upon the efforts of nearly 1,000 adult volunteers—The Criterion asked Williams to share his insights about the effects of this biannual gathering on Catholic teenagers. Q. From your experience in youth ministry, what overall impact does experiencing NCYC have on the youths who attend this conference? Q. For youths who attend public schools or live in small communities where there are not a lot of Catholic youths present, what’s the impact on them of being part of more than 20,000 young people sharing their faith together? Q. More than 1,500 teenagers from across central and southern Indiana will participate in this year’s NCYC. 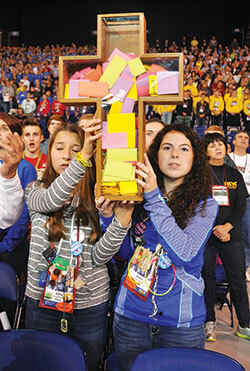 How do you see the youths’ involvement in NCYC having an impact on their parishes and even the archdiocese? A. “Teens that go to this conference have a great experience there, but it’s mostly about what happens when they come home. While it might be in Indianapolis, it is a pilgrimage. Part of being on pilgrimage means returning home. I’ve seen new programs started by teens, teens taking new leadership roles and, most of all, empowerment to take part in their local community. However, it takes an invitation to make that a reality. Q. Adult volunteers are always needed for NCYC. If anyone is interested in volunteering, who should they contact? And what do you think volunteers gain from being part of this experience? Q. What does it mean to you personally to be involved in NCYC, and what impact has it had on your faith?